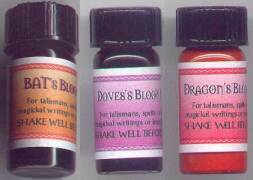 A Selection of Magickal Ink for Rituals, Spells and Magickal Writings - Dragons Blood, Doves Blood and Bats Blood - The Realm of White Magic - On-line Ordering. Empower your Realm of spiritual well-being with the magic of Incense, Herbs, Powders, Crystals, Spells and much more. Specialists in rare botanicals, incense and magical supplies since 1989. 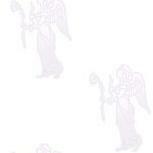 Special Ink for creating Talismans on Parchment paper and for Spell work. Use to write in a book of shadows and other magical writings or inscriptions. As seen in Australian Witchcraft Magazine, Issue No. 4. Do you need Parchment Paper? Have you seen our colourful Feather Quills? A quill or nib pen is required to use our Magical Inks. Large selection available. Water, Fire, Earth and Air plus special Gold, Silver and Copper inks. Ink nibs also available.